He has cross functional exposure within the banking industry in the areas of Financial Control, Operations and Relationship Management in Corporate, Commercial and Retail Banking at Senior Management levels. Tunde obtained a B.Sc. degree from the University of Ife and a Master’s degree in Business Administration (MBA) from the University of Lagos. 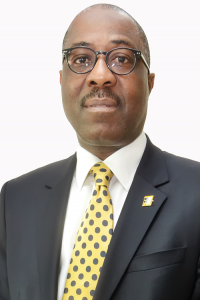 He is a fellow of both the institute of Chartered Accountants of Nigeria (FCA) and the Chartered Institute of Taxation (FCTI), a full member of the Nigerian Institute of Management (MNIM) and Honorary member of the Chartered Institute of Bankers (HCIB). He is also an alumnus of the Lagos Business School and has attended many professional development courses globally. Tunde is happily married with children and loves listening to contemporary jazz music. He is a member of Ikoyi Club, Ikeja and Lakowe Golf Clubs where he plays golf at his spare time.